The auto transporting & trailering sector is one of the most vital and flourishing industries in USA. It plays a substantial role in ensuring movement of vehicles over great distances for numerous corporations, car dealers and consumers. In addition to that, auto trailering is trusted by many as an environment-friendly way to move cars, without causing major wear & tear of the vehicles. Auto trailering businesses are of various types - those which move regular vehicles, those transporting exotic & vintage cars, and the ones offering both types of services. Once you’ve determined the nature of your proposed business, it will be easier to decide whether you need enclosed or open car trailers. Do some research on the services provided by competitor businesses in your area. In case they cover a huge portion of the market, make sure you offer at least one specialised auto trailering service. Find out about the right authority and obtain a commercial driver’s license before you proceed with your plans. Also, secure a transportation license and motor carrier number from Dept. of Transportation. With the help of a reliable professional, formulate a business plan to factor in start-up expenses, market scenario, marketing strategy, projected revenue, etc. If you can bear all the investment expenses on your own, then it’s great. Otherwise, you have the option of gathering capital through presentation of your plan in front of your bank or private investors. Invest in liability and cargo insurance to protect yourself from any losses triggered by damage to the vehicles of your client. For your trailering business, pick a nice location that has access to all the primary routes and also enough space for loading & unloading activities. Get all the necessary equipment that you need in order to kickstart your business - tow truck, trailer, winch, etc. Once you are done with the above mentioned steps, simply open shop and advertise your trade appropriately. 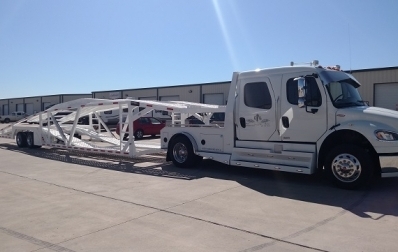 If you are looking for heavy-duty open car trailers, then get in touch with us at Infinity Trailers. We offer financing options too, for those with limited budget. If you liked this post, please leave your feedback in the comment section below.